Pre-requisite: Camera should be attached to the computer & check that it is working in your setup. On clicking `Record', you will see that Loading is going on. When loading will be over then give access to Camera and Microphone. On clicking , you will see that your Camera is On, you can see frames on which camera is focused and `Show Settings' link. On clicking , no frame will be shown in the Monitor Window. Your screen will look like below image. If you clicked on deny and want to record frames then you need to change your preferences. See Settings for more information. 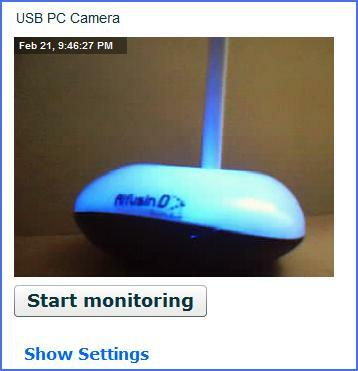 On Clicking `Start Monitoring', Recording will start. Number of frames recorded after every periodical time and after how many minutes next frames will be recorded. Number of frames left for the day. You can change you recoding preferences. See Settings for more information. 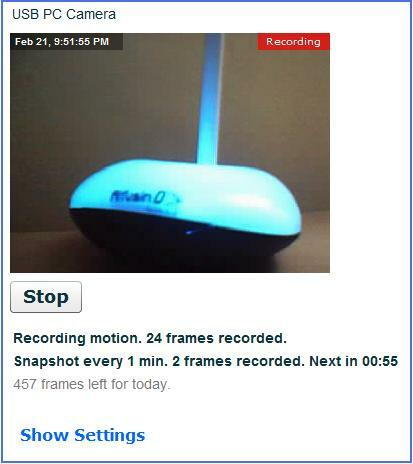 To stop recording, click on `Stop' button and recording of frames will stop. 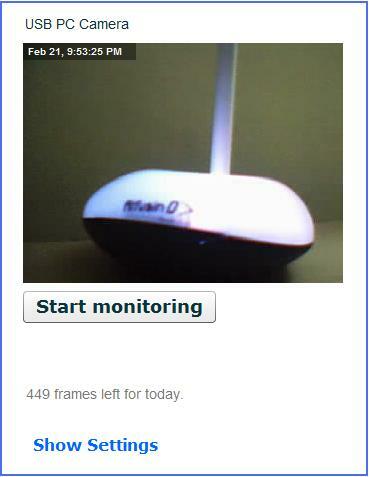 You will also see the number of frames left for the day. On clicking `Show Settings', you will see Settings dialog. 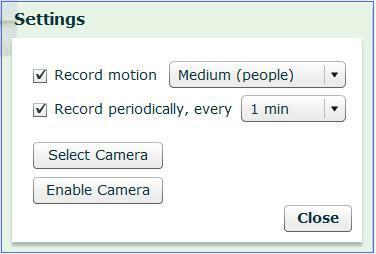 Record Motion, provides facility of recording frames when there is motion in front of camera. Different types of motions you can use - Big Changes Only, Medium (people), Small (pets, birds) and Everything. Big Changes Only: Frames will be recorded when there is big or major change in front of the camera. Like a person is sitting in front of camera and now he has moved to some other place then next frame will be recorded. Medium (people): Frames will be recorded when there is medium change in front of the camera. Like focus of the camera is on two persons having coffee with biscuits. When they move to drink coffee or to eat biscuits then no frame will be recorded but if some person moves out of the focus or some other person has joined them then next frame will be recorded. 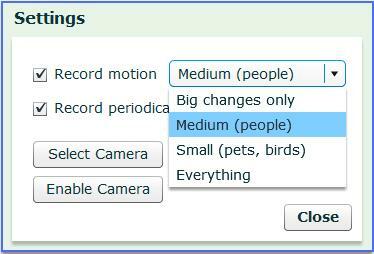 Small (pets, birds): Frames will be recorded when there is small change in front of the camera. Like focus of the camera is on a person sitting with his dog. If person or dog is not moving then no frame will be recorded but if dog is moving on persons left, right, front, back then in this situation next frame will be recorded. Everything: Frames will be recorded when there is any change in front of the camera. Like focus of the camera is on a person sitting with his dog. If person or dog is not moving then no frame will be recorded but if person is putting his hand on the dog or dog is moving his head then in this situation next frame will be recorded. Record periodically, provides facility of recording frames after a set interval of time. You can define that frame should be recorded after 1 min, 2 min, 5 min, 10 min, 30 min, 1 hour or 1 day. On selecting time interval as 5 min, then a frame will be recorded after every 5 mins like at 7:00 then at 7:05 then at 7:10 then . . . . . . . . . . at 7:55 and so on . . . .
On clicking `Select Camera', `Adobe Flash Player Settings' will open. 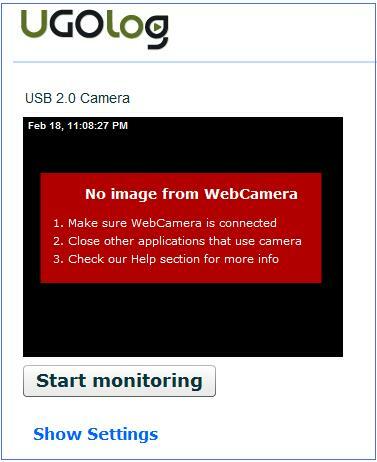 Click on the drop list and you see cameras attached to your computer. Select the camera with which you want to record frames. 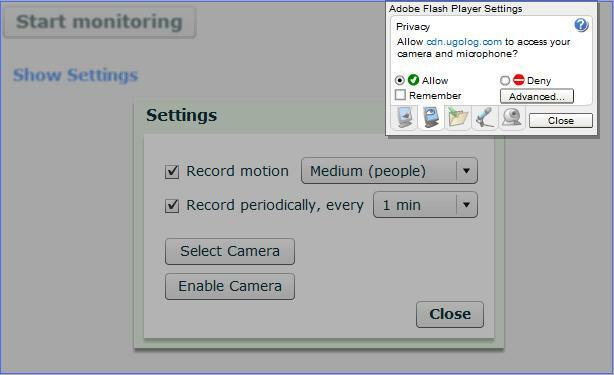 When you click on `Enable Camera', then `Adobe Flash Player Settings' dialog will open. 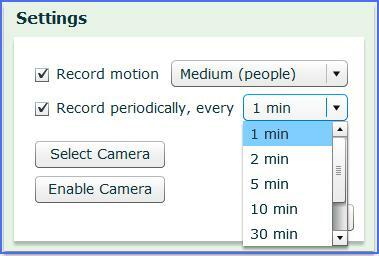 Initially you will see that option selected which was selected when you clicked on Record tab. Deny as selected & Remember as unchecked, then nothing will be shown in the Monitor Window. Deny as selected & Remember as checked, then nothing will be shown in the Monitor Window and next time on coming to Record tab you will not see `Allow Camera and Microphone access dialog. Allow as selected & Remember as unchecked then you will see that your Camera is On, you can see frames on which your camera is focused. 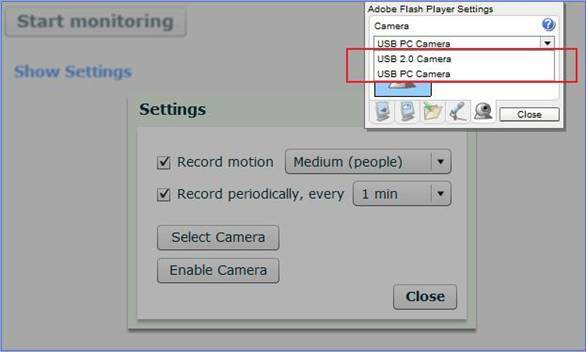 Allow as selected & Remember as checked then you will see that your Camera is On, you can see frames on which your camera is focused and next time on coming to Record tab you will not see `Allow Camera and Microphone access dialog.